The following instructions were written for Ubuntu 10.10. However, for other distributions the installation should be similar. Note that we can't guarantee you that Rybka will run on your Linux system, since it's not officially supported. Using Wine or Microwine does not slow down Rybka. The combined engine file you can create with Microwine behaves like a native Linux version. 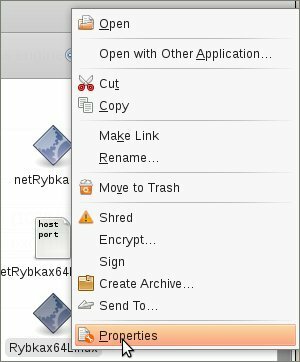 Rybka is written for Windows, so there are some tricks necessary to get Rybka running under Linux. (you could also use Synaptic of course). You can open a terminal via "Accessories->Terminal"
Some of the Windows GUIs also work with Wine, like Aquarium or Arena, which both have been optimized for Wine. For Aquarium you can find extra files and installation tips in in our forum. Rybka is much faster on 64-bit than on 32-bit, so if your computer supports 64-bit, you definitely want to use the 64-bit version of Rybka. The main problem is that the Wine version installed via the package manager doesn't run 64-bit applications. There are two different solutions, the first allows you to run 64 bit engines in general by enabling 64 bit support in Wine, but has the disadvantage of needing to compile Wine, which means you don't get updates via the package manager. The second solution uses the program "Microwine" to start Rybka, but needs "Netchess" to connect to the engine from the GUI. That second solution only works with Rybka, but is preferable for native GUIs. 1. Before trying this method, uninstall Wine and rename the home/username/.wine/ folder to something like e.g. home/username/.wine2/. If Wine isn't installed, this step is not needed. On my system, the command to start Aquarium is e.g. The command to use the old, 32 bit Wine prefix is e.g. There are also automated installation scripts created by Jesse Gerensson, you can find them in our forum. Steinar H. Gunderson programmed a tool called "Microwine", which can start the 64-bit version of Rybka. With this program, you can create a combined engine file, that behaves just like a native Linux engine. The expressions in brackets need to be replaced, but instead of typing the complete path, you can drag&drop files to the terminal (which adds the path to the command). Don't forget the space between the paths! The resulting file is placed in your home folder. You just need to make the file executable now by right-clicking on the File and selecting properties. 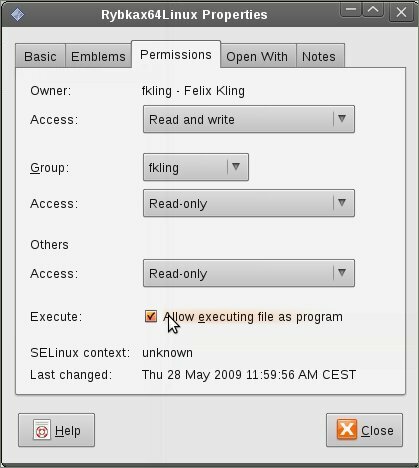 Then check in the permission category allow executing the program. Now the engine can already be used by native Linux GUIs. To make the communication between engine and GUI possible, you need the program netchess. 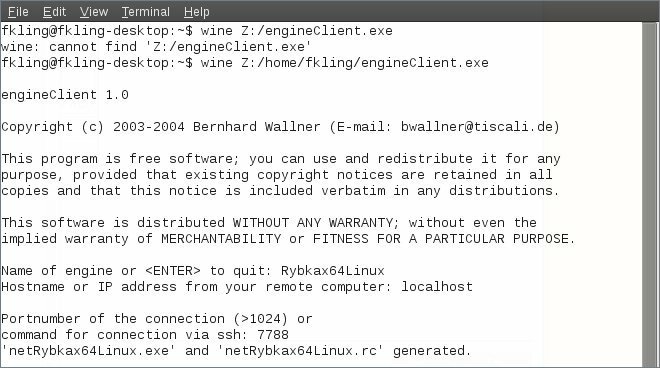 Download engineServer.tcl and engineClient.exe from http://home.arcor.de/bernhard.wallner/netChess.html. 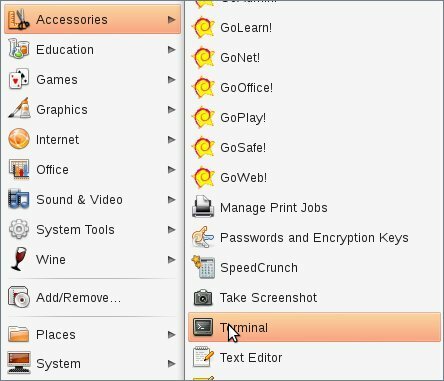 Note that you need the English version of Ubuntu, so change your language to English in the system administration menu. At least with the German version connecting engineServer.tcl and engineClient.exe didn't work. The program asks you to enter a name for the resulting .exe (like Rybkax64Linux), the IP of the server (e.g. localhost, alternatively 127.0.0.1) and the port number (e.g. 7788). In our example the file "netRybkax64.exe" was created in the home folder. That's it, now you can start Rybka by installing the created netRybkax64Linux file just like a normal Windows engine with a Windows GUI. To start the server automatically at the system start, go to "System->Preferences->Startup Applications" and create a new entry using the command for starting the server. To connect to this server, start the engineClient.exe on another computer and instead of "localhost" (what we used before) use the IP (e.g. 192.168.1.34). You may need to open the port (i.e. 7788 in our example) by editing the configuration of your router, look up how to do that in it's manual. Not every GUI programmed for Windows runs with Wine under Linux, also connecting to the engine via netchess doesn't always work. In the following table "32 bit" means that the GUI runs under Wine and can start Rybka as 32 bit engine, 64 bit that the netchess trick works. All the tests were done with Wine 1.3, the list of GUIs is not complete of course and there is no guarantee that the results are also true for your system. Note that e.g. Fritz can connect to a Linux computer if you use one computer with Linux as server only and connect from a computer with Windows via netchess. Aquarium 4.05 yes yes Optimized for Wine. FAQ and additional files in our forum. Arena 2.01 yes ? Optimized for Wine. Seems not to work on any system. Fritz 12 download no no Doesn't work, graphic errors. If you have further questions, please visit our forum.